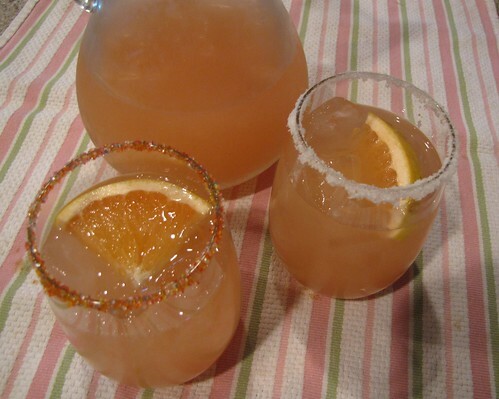 Grapefruit Margaritas – just in time for Cinco de Mayo! Henry also says he is glad I didn’t see the photo going around Facebook of the kitten wearing a tiny sombrero before I started drinking these. Let’s get right to it. Margarita meets Pink Grapefruit and good things happen. Pink Grapefruit, Limes (you will need more than 2), Tequila, Triple Sec, Salt, and Sugar (optional & not pictured). You also need ice. Full disclaimer…usually I would have better tequila for margaritas. This was in the cabinet from making Tequila Lime Chicken and is considered the “cooking tequila” around here. For drinks, I think the flavor is better (and the margaritas a little less heartburn-y) if you have a higher quality tequila. Choose your favorite – Hornitos is always good or you can indulge your inner 80’s hair band past and grab a bottle of Sammy Hagar’s Cabo Wabo. 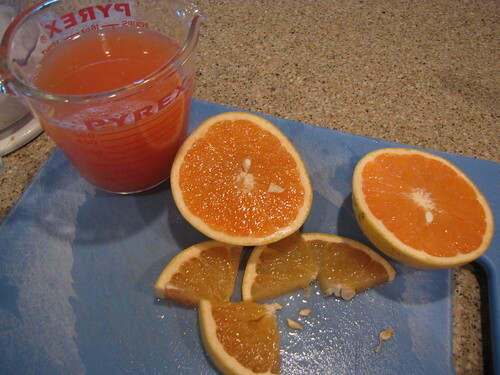 Squeeze 2 cups of juice from 2-3 fresh pink grapefruit. Slice a few wedges off for a garnish before you start juicing. I have the world’s juiciest limes so it only took me 2 limes to make 1 cup of juice. Honestly. These things are the size of a tennis ball this time of year. So good. For 1 cup of juice you will probably need between 4-6 grocery store limes. If you like your margaritas on the rocks like me, build them in a pitcher. If you like them frozen, get out the blender. 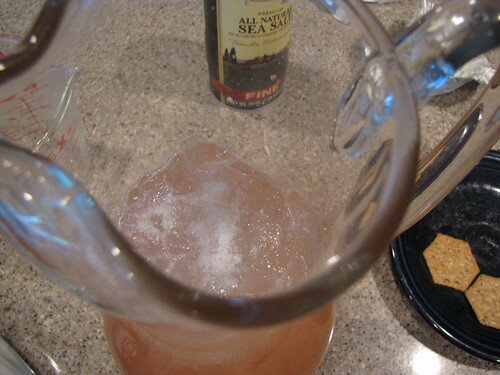 Pour 2 cups of grapefruit juice, 1 cup of lime juice, 1 cup of tequila, and 1 cup of triple sec into a large pitcher. 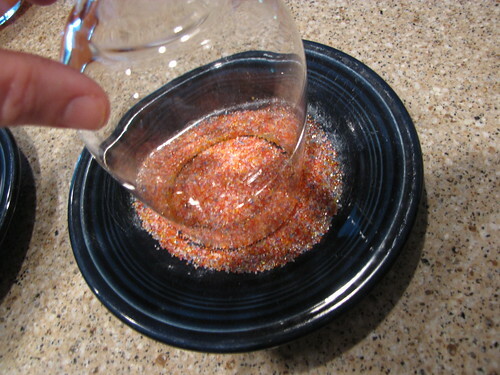 Add a big pinch of salt to the pitcher. 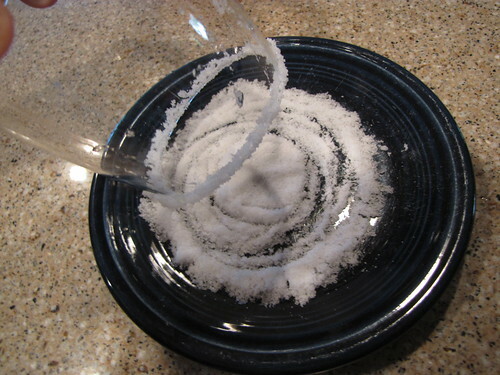 I am not a salt on margaritas kind of girl but I learned this trick a few years ago. Just a pinch in the drink itself really brings out the flavors. Add 2 cups of ice and stir to combine and chill. Note: If you’re not going to be drinking these right away, skip the ice until you are ready to serve so it doesn’t melt and dilute your drink. Also, give these a taste and adjust to your own level of booziness. I like these proportions but you might want them stronger or sweeter. Fancy rims on the glass are fun. Run a wedge of lime around the top of a glass and then dip it a saucer of salt. Or EVEN BETTER (because these are a tad on the tart side), dip your glass in a saucer of fun sugar! I knew those leftover sugar cookie sprinkles would come in handy one of these days! Put a little ice in the glasses and pour yourself a refreshing Grapefruit Margarita. 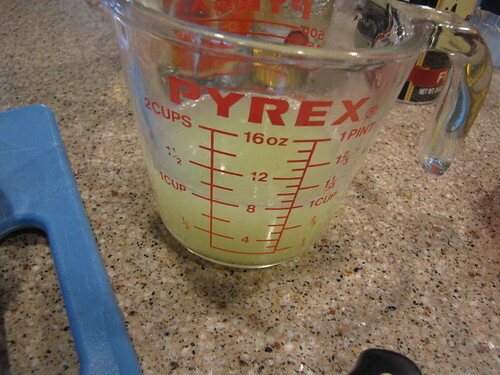 This recipe makes a nice pitcher of margaritas that should serve about 6 generous drinks. If you need some recipe suggestions for actual food to have with your refreshing beverages, there is a link in the Categories List (right side of the blog) for Mexican & Southwestern Recipes. You can also find them on the Recipe Page. 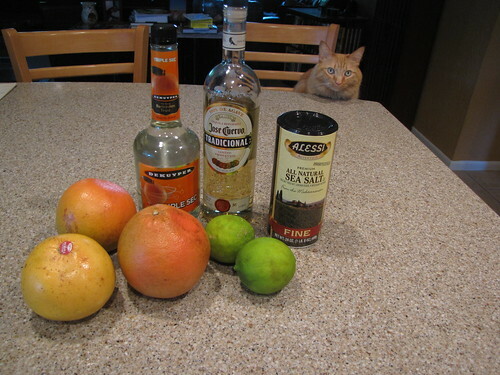 Whatever you make, Cinco de Mayo or any other day will be improved by Grapefruit Margaritas! Oh man, those look fantastic! Normally I’m a classic lime margarita kind of girl but I have such a soft spot for pink grapefruit. I’m a classic lime margarita on-the-rocks fan, but like the reader above, I could give this recipe a whirl. Really, I need you to move to my town and set up a cafe in my work or home neighborhoods (easy-peasy, as the two are less than 2 miles apart and they NEED some more restaurants!). I’d walk to work all summer long if I could stop by and have one of these on my way home. Ha! We could trade drinks for lilacs. Oh, and cute beaded earrings! I see a plot unfolding.